My last article was mainly about Collaborative Information Seeking – one of the trends in enterprise search. Another interesting topic is the use of games’ mechanics in CIS systems. I met up with this idea during previously mentioned ESE 2014 conference, but interest is so high, that this year in Amsterdam a GamifIR (workshops on Gamification for Information Retrieval) took place. IR community have debated about what kind of benefits can IR tasks bring from games’ techniques. Workshops cover gamified task in context of searching, natural language processing, analyzing user behavior or collaborating. The last one was discussed in article titled “Enhancing Collaborative Search Systems Engagement Through Gamification” and has been mentioned by Martin White in his great presentation about search trends on last ESE summit. Gamification is a concept which provides and uses game elements in non-game environment. Its goal is to improve customers or employees motivation for using some services. In the case of Information Retrieval it is e.g. encouraging people to find information in more efficient way. It is quite instinctive because competition is an inherent part of human nature. Long time ago, business sectors have noticed that higher engagement, activating new users and establishing interaction between them, rewarding the effort of doing something lead to measurable results. Even if quality of data given by users could be higher. Among those elements can be included: leaderboards, levels, badges, achievements, time or resources limitation, challenges and many others. There are even described design patterns and models connected with gameplay, components, game practices and processes. Such rules are essential because virtual badge has no value until being assigned by user. Collaborative Information Seeking is an idea suited for people cooperating on complex task which leads to find specific information. Systems like this support team work, coordinate actions and improve communication in many different ways and with usage of various mechanisms. At first glance it seems that gamification is perfect adopted to CIS projects. Seekers become more social, feeling of competence foster actions which in turn are rewarded. The most important thing is to know why do we need gamified system and what kind of benefits we will get. Next step is to understand fundamental elements of a game and find out how adopt them to IR case. In their article “Enhancing Collaborative Search Systems Engagement Through Gamification”, researchers of Granada and Holguin universities have listed propositions how to gamify CIS system. Based on their suggestions I think essential points are to prepare highly sociable environment for seekers. Every player (seeker) needs to have own personal profile which stores previous achievements and can be customized. Constant feedback on progress, list of successful members, time limitations, keeping the spirit of competition by all kinds of widgets are important for motivating and building a loyalty. Worth to remember that points collected after achieving goals need to be converted into virtual values which can distinguish the most active players. Crucial thing is to construct clear and fair principles, because often information seeking with such elements is a fun and it can’t be ruined. Researchers from Finnish universities, who published article “Does Gamification Work?”, have broken down a problem of gamifying into components and have thoroughly studied them. Their conclusion was that concept of gamification can work, but there are some weaknesses – context which is going to be gamified and the quality of the users. Probably, the main problem is lack of knowledge which elements really provide benefits. Gamification can be treated as a new way to deal with complex data structures. Limitations of data analyzing can be replaced by mechanism which increase activity of users in Information Retrieval process. Even more – such concept may leads to more higher quality data, because of increased people motivation. I believe, Collaborative Information Seeking, Gamification and similar ideas are one of the solutions how to improve search experience by helping people to become better searchers than not by just tuning up algorithms. To achieve a high NPS, Net Promoter Score, the customer experience (cx) is crucial and a critical factor behind a positive customer experience is the ease of doing business. For companies who interact with their customers through the web (which ought to be almost every company these days) this of course implies a need to have good Findability and search on the website in order for visitors to be able to find what they are looking for without effort. The idea is that Promoters—the loyal, enthusiastic customers who love doing business with you—are worth far more to your company than passive customers or detractors. To obtain the actual NPS score the percentage of Detractors is deducted from the percentage of Promoters. According to ‘voice of the customer’ research conducted by British customer experience consultancy Cape Consulting the ease of doing business and the touch point experience accounts for 60 % of the Net Promoter Score, with some variations between different industry sectors. Both factors are directly correlated to how easy it is for customers to find what they are looking for on the web and how easily front-line employees can find the right information to help and guide the customer. Successful companies devote much attention to user experience on their website but when trying to figure out how most visitors will behave website owners tend to overlook the search function. Hence visitors who are unfamiliar with the design struggle to find the product or information they are looking for causing unnecessary frustration and quite possibly the customer/potential customer runs out of patience with the company. Ideally, Findability on a company website or ecommerce site is a state where desired content is displayed immediately without any effort at all. Product recommendations based on the behavior of previous visitors is an example but it has limitations and requires a large set of data to be accurate. When a visitor has a very specific query, a long tail search, the accuracy becomes even more important because there will be no such thing as a close enough answer. Imagine a visitor to a logistics company website looking for information about delivery times from one city to another, an ecommerce site where the visitor has found the right product but wants to know the company’s return policy before making a purchase or a visitor to a hospital’s website looking for contact details to a specific department. Examples like these are situations where there is only one correct answer and failure to deliver that answer in a simple and reliable manner will negatively impact the customer experience and probably create a frustrated visitor who might leave the site and look at the competition instead. Google has taught people how to search and what to expect from a search function. Step one is to create a user friendly search function on your website but then you must actively maintain the master data, business rules, relevance models and the zero-results hits to make sure the customer experience is aligned. Also, take a look at the keywords and phrases your visitors use when searching. This is useful business intelligence about your customers and it can also indicate what type of information you should highlight on your website. Achieving good Findability on your website requires more than just the right technology and modern website design. It is an ongoing process that successfully managed can have a huge impact on the customer experience and your NPS which means your investment in search will generate positive results on your bottom line. More posts on this topic will follow. Why is Search Easy and Hard? This years keynote speaker was Dan Russell, a researcher from Google. He talked about Search Quality and user happiness; Why search is easy and hard. The point I found most interesting in his presentation was how improvement is not only needed when it comes to tools and data but also improving the users’ search skills. My own experience from various search projects is similar; users are not good at searching. Even though they are looking for a specific version of a technical documentation for a specific product they might just enter the name of the product, or even the product family. (It’s a bit like searching for ‘camera’ when you expect to find support documentation on your Dioptric lens for you Canon EOS 60D.) So I agree that users need better search skills. In his presentation Russell also presented some ideas on how a search application can help users improve their search skills. Not only deliver relevant documents, but provide facilities for making meaning with those documents. Increase user responsibility as well as control; that is, the systems require and reward human effort. Offer the flexibility to adapt to user knowledge / sophistication / information need. Are engaging and fun to use. The winner of the challenge was a team of researchers from Yahoo Labs who presented Searching Through Time in the New York Times. The Time Explorer features a results page with an interactive time line that illustrates how the volume of articles (results) have changed over time. I recommend that you read the article in tech review to learn more about the project, or try out the Time explorer demo yourself. You can also learn more about the challenge in this blog post by Gene Golovchinsky. All the papers and posters from the workshop can be found on the new website. Search is the worst usability problem on the web according to Peter Morville (in his book Search Patterns). With that in mind it is good to know that there are best practices and search patterns that one can follow to ensure that your search will work. Yet, just applying best practices and patterns will not always do the trick for you. Patterns are examples of good things that often work but they do not come with a guarantee that your users will understand and use search simply because you used best practice solutions. Your search logs are another valuable source of information regarding your users behaviors. Have a look at them as a complement. And the best part of testing your ideas with users is, as a bonus you will learn even more stuff about your users that will be valuable to you in the future. Even if you are evaluating the smallest part of your website you will learn things that affects the experience of the overall site. So what are you waiting for? Start testing your site as well. I promise you will learn a lot from it. If you have any questions about how to best evaluate the search functionality on your site or intranet, write a comment here or drop me an email. In the meanwhile we will soon go on summer holiday. But we’ll be back again in August. Have a nice summer everyone! Finding information can be tricky and as I have written about in one of my previous posts improving findability is not about providing a single entrypoint to information. 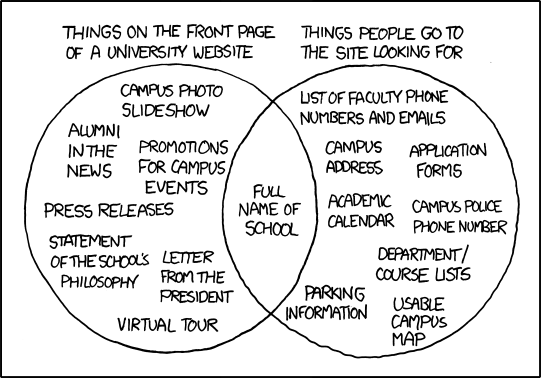 Users have different ways of finding information (browsing, searching and asking). They often combine these techniques with each other (berrypicking) and so they all need to be supported. Peter Morville states that. A lot of sites are improving their search experience through the implementation of faceted search. However, very few successfully integrate faceted search and browsing on their site. Searching and browsing are treated as two separate flows of interaction instead of trying to combine them which would provide the users with a much better experience. I find this idea interesting and I am currently thinking about whether it could be applied into one of my own projects. (According to Greg it has not been implemented anywhere yet even though the findings from the usability testing were positive.) However I wonder if this is a concept that works well only for sites with relatively homogeneous content or if it would also work on larger collections of sites such as intranets? Can it be used in an intuitive way with a large number of facets and can it cope with the use of more complex filtering functionalities? For some sites it might not be the best idea to keep the search settings when the user changes search terms. These are some things I would like to find out. What do you think about this? Could you apply it to your site(s)? I recommend that you have a look at Greg Nudelman’s presentation on slideshare and find out for yourself. You can also find an article about the Integrated Faceted Breadcrumb on Boxes and Arrows. I look forward to a discussion about whether this is any good so write me a comment here at the findability blog or find me on twitter. This upcoming week my colleague Lina and I will participate in the IASummit in Phoenix Arizona. Search, information architecture and user experience and the relationships between them is the focus for us this upcoming week. We look forward to hearing a lot of great talks, meeting interesting people and enjoying the sunny weather in Arizona. We will be blogging from the conference but if you don’t want to wait for that you can follow me, Maria on twitter or follow the hashtag for the IASummit #ias10 so see what everyone is tweeting about. My RSS feeds have been buzzing about the LinkedIn faceted search since it was first released from beta in December. So why is the new search at LinkedIn so interesting that people are almost constantly discussing it? I think it’s partly because LinkedIn is a site that is used by most professionals and searching for people is core functionality on LinkedIn. But the search interface on LinkedIn is also a very good example of faceted search. I decided to have a closer look into their search. The first thing I realized was just how many different kinds of searches there are on LinkedIn. Not only the obvious people search but also, job, news, forum, group, company, address book, answers and reference search. LinkedIn has managed to integrate search so that it’s the natural way of finding information on the site. People search is the most prominent search functionality but not the only one. I’ve seen several different people search implementations and they often have a tendency to work more or less like phone books. If you know the name you type it and get the number. And if you’re lucky you can also get the name if you only have the number. There is seldom anyway to search for people with a certain competence or from a geographic area. LinkedIn sets a good example of how searching for people could and should work. LinkedIn has taken careful consideration of their users; What information they are looking for, how they want it presented and how they need to filter searches in order to find the right people. The details that I personally like are the possibility to search within filters for matching options (I worked on a similar solution last year) and how different filters are displayed (or at least in different order) depending on what query the user types. If you want to know more about how the faceted search at LinkedIn was designed, check out the blog post by Sara Alpern. But LinkedIn is not only interesting because of the good search experience. It’s also interesting from a technical perspective. The LinkedIn search is built on open source so they have developed everything themselves. For those of you interested in the technology behind the new LinkedIn search I recommend “LinkedIn search a look beneath the hood”, by Daniel Tunkelang where he links to a presentation by John Wang search architect at LinkedIn.